The manual dripping method with paper pulp is a kind of filling technique for conserving paper objects. Compared with the traditional paper repair method, this method is more suitable for conserving objects which have been seriously damaged and/or with lots of insect holes. Efficiency, flatness and reduced use of paste are part of this method’s benefits. This lecture will introduce the development and application of the pulp repair technique in Mainland China and foreign countries. Additionally, the lecture will discuss the advantages and disadvantages of four different repair methods, namely, traditional paper repair method, paper pulp manual dripping method, semi-mechanical pulp repair method and leaf-casting method. We hear words like culture, heritage, conservation, restoration, etc., every day, but do we fully understand their meaning? An explanation of these terms is shared with the audience throughout this lecture. The lecture mainly outlines what culture, cultural heritage, and tangible and intangible cultural heritage are; how to preserve them; and introduces the types of conservation in different museums. Finally, the daily workload of an object conservator will be discussed. The purpose is to provide Macao citizens with a preliminary understanding of the conservation and restoration of cultural heritage, hopefully increasing the public’s awareness and interest in cultural heritage as a means to achieve sustainable development. Paper splitting involves splitting the paper into two layers and adding a thin piece of acid-free paper in between to create a “sandwich” structure. This method is especially suitable for severely deteriorated paper. The advantage of using this method is that it does not affect the object’s appearance and fragile paper objects can be well conserved. Paper splitting is often used to conserve and reinforce archives and rare books that are severely embrittled, such as old newspapers. There are two types of paper splitting methods: machine splitting and manual splitting. The principle of these two methods are similar and the only difference is that manual splitting must be done by a skilled person. 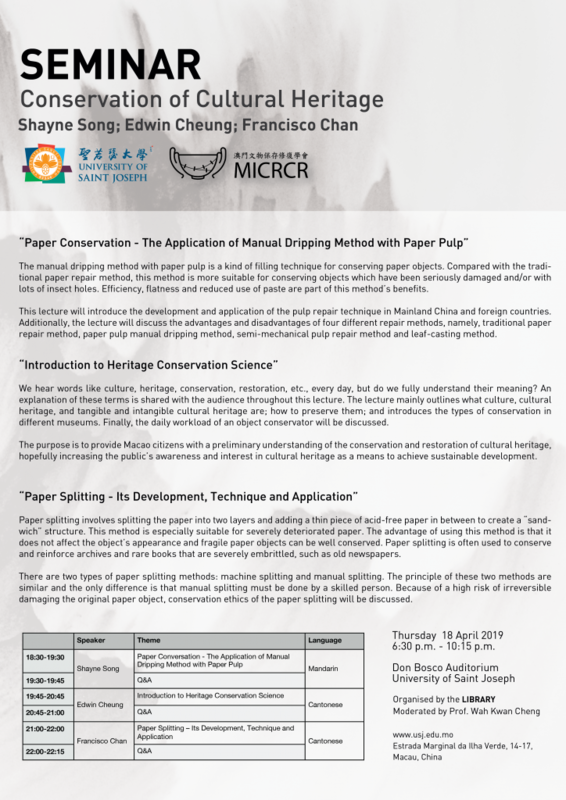 Because of a high risk of irreversible damaging the original paper object, conservation ethics of the paper splitting will be discussed.